I know, I know, everyone has made a spiral card by now. But have you thought about what would happen if you made a spiral that didn't start as a circle? 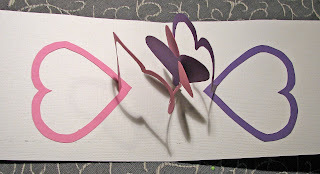 And what if you made two spirals, and joined them above the card crease to make a card that could open 180°? Now that's interesting. I like the X-form heart you can create at the center. 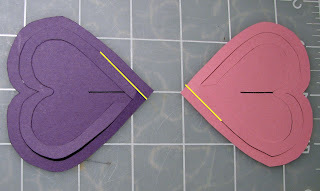 If you have never made a circular spiral card, make that first as a warm-up. 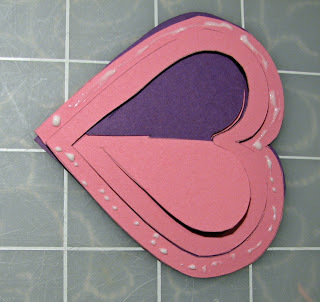 Take your pick of tutorials: Splitcoaststampers or Sparkle Daisy or Mary Beth Cryan are all good. Download cutting files: PDF, SVG, Silhouette Studio. 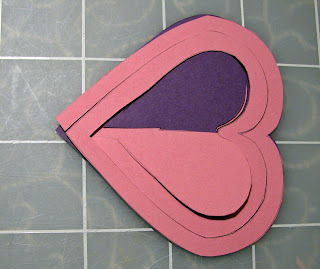 Cut out the two heart spirals. 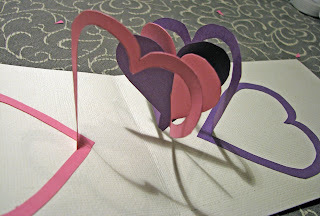 Place them with the spirals going in opposite directions: the hearts flipped both horizontally and vertically from each other. See those yellow lines? 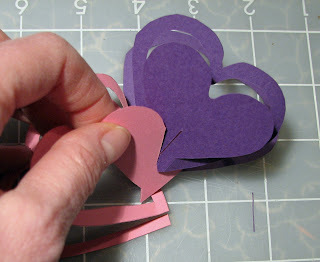 They are highlighting the beginning of the cut on each heart. One cut heads toward the top left, the other toward the bottom right. 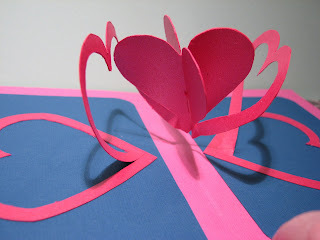 Score and crease each spiral at the bottom of the heart. Be sure the hearts can collapse flat. If not, switch how you have the hearts slotted together. 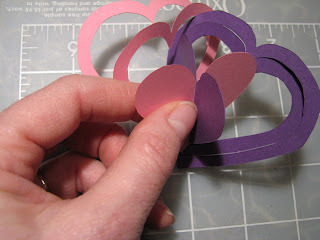 Spread glue on just the outside heart of one spiral (pink). 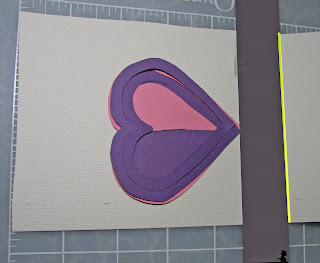 Place the heart, glue side down, at a 90° angle to the center crease of the card. For the sample I placed the point of the heart about 1" from the crease but I think this stretches the spiral out a little too much. I'd say somewhere between 1/2" and 3/4" would be better. 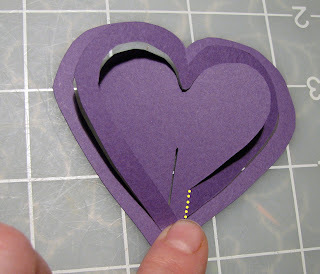 Spread glue on the outermost heart of the other spiral (purple). 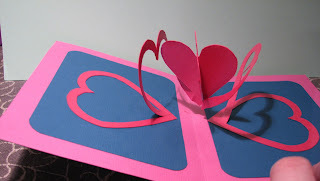 Check to make sure the hearts are still lined up exactly on top of each other, then close the card to glue it all together. Allow to dry, then open. This one's better--the points are a little closer to the center fold of the card. Check out TAVIORI's spiral variations. 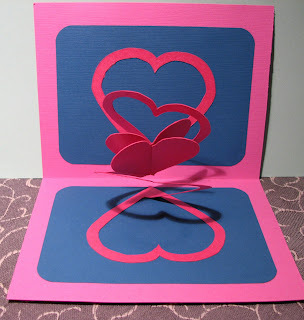 Rich of Creative Pop Up Cards, whose card was my inspiration, now has templates and a tutorial for this card on his site, including an entire alphabet set of heart initials. Galinblack had a great idea, combining pop up words with a spiral.